Tomatoes tried to kill me but banjos saved my life (playing at the 2018 Toronto Fringe Festival) is a former executive’s musical memoir, fusing his life experiences with his love for banjos. Your enjoyment of this show will vary in proportion to (1) how much you enjoy roots music, and (2) how charming you find Keith Alessi, the man at the centre of this autobiography. His advice, about the importance of seizing today and actualizing your passions instead of leaving them to languish in storage, is valid and relevant in a cultural moment when our society seems to be pulling at these particular seams. And his story, which is rooted in a frank description of what happens when the dreams of immigrants get thwarted, is a further challenge to those of us who have more advantages. 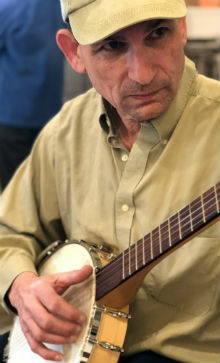 And the music’s pretty lovely, too: I’m one of those hipsters who has The Carter Family in my Spotify playlists, so I was especially drawn to the Appalachian folk coming out of his custom-built Jason Romero masterwork instrument. But there’s also an elephant in the room: Alessi’s the sort of guy who did so well on Wall Street that he was able to retire at age 40 and launch a second career as a university lecturer who swoops in to save failing companies when he feels like a challenge. And while I don’t mean to diminish his accomplishments, I do feel myself compelled to observe that it’s pretty easy for someone who makes $4m in a “bad” year to encourage young people to follow their bliss and seize the day. The flipside, of course, is that Alessi worked for his money. This isn’t some idle inheritor dispensing pearls of questionable wisdom for a six-figure fee: he’s lived a hard life where he had to make difficult choices, some of which he details here. Many of the lessons he outlined came to him the hard way, as he tried to reconcile his priorities and the outcomes of his actions with the promises he’d made to himself as a much younger man. It’s an interesting angle, and I think it’s what helps to elevate this above what it might otherwise be. I liked Alessi, and I liked him more than I expected to. At times, the show can get a little TED Talk-y, and we see the business professor coming to the fore. But when he plays, it all washes away. All that’s left behind is a man and an instrument, and my, do they work well together.